The Monterey City Disposal Service (MCDS) provides the highest quality refuse and recycling collection services for the City of Monterey. This page is a collection of answers to the most common questions we get asked. If you have further questions about the services we offer please just give us a call, (831) 372-7977. "How do I start new service?" If you have just moved into a home or apartment or if you've just started a business within the City of Monterey call us at (831) 372-7977 to establish service. This is also a good time to learn about what can and can't be put in your three color-coded carts. "How do I ask about a bill?" Have questions about your bill? Give us a call at (831) 372-7977 and let us help you. "How do I update my address?" If you are moving, please give us a call to stop service at your residence so you don't get charged for additional waste service. Please leave the carts for the next resident to use. "How do I report illegal dumping?" Litter is a problem in our community. Monterey County is one of the most beautiful spots in California yet a trip on area roadways can reveal medians, roadsides, and parking lots strewn with litter. Litter is not only an eyesore, it poses health risks, impacts our coastal waters and is costly to cleanup. To report a litter problem, we link you directly with a Website created by the Monterey Regional Waste Management District. This Website is designed to help solve litter problems and to recognize the great work many businesses and civic groups are doing to help keep Monterey County clean. Go to http://keepmontereycountyclean.org to report litter. "How do I recycle electronic waste, like old computers, printers, faxes, etc.?" Look on our Safe Disposal page for all the information you need. "How do I recycle, what goes where"
Please refer to the app below and download to your phone. It can also be added as an app to your smartphone. 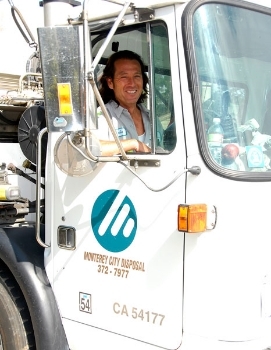 The Monterey Disposal Service family is made up of many very special people. Our team is our most valuable resource and the main reason for our success. Our family owned and run operation ensures that we help maintain the character of the city and not dictate through the demands of a larger, out of touch operation. Our team, made up of drivers, Material Recovery Facility workers and Customer Service Representatives all work together to provide the best services for collecting waste, diverting valuable resources from the landfill, providing exceptional customer services and helping our environment. Our mission is to provide the residents and businesses of Monterey the highest quality solid waste and recycling services in order to preserve resources, protect the environment and contribute to making our world community a cleaner, safer place to live.